My latest book review, "The Spring Classics: Cycling's Greatest One Day Races," published by the nice people at VeloPress, has just appeared at Pezcyclingnews.com, and you can read the whole thing here. There are a lot of great photos in this large-format volume, and I really enjoyed the stories as well. 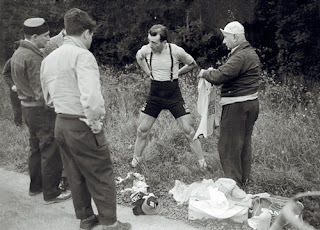 And the next time somebody says that cyclists all look malnourished, show them this photo of three-time Tour de France winner Louison Bobet, who has legs like I have never seen before. In the pantheon of Tour winners, Bobet seems to be somewhat forgotten. 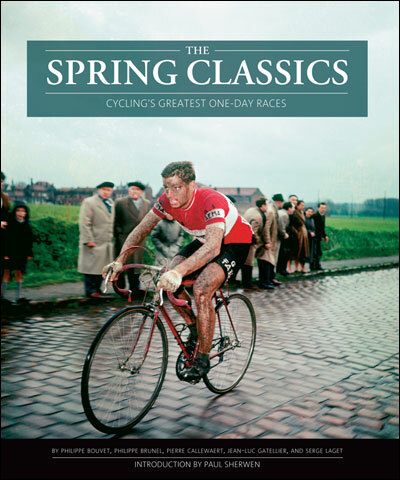 In addition, he was World Champion in 1951 and features quite a bit in this book as he also won, among other things, Milan-San Remo, Paris-Roubaix, the Tour of Flanders and the Tour of Lombardy. The photo shows him at Bordeaux-Paris, a ridiculous race that covered 550 km non-stop, using motorpacing!